Rock Paper Lizard: Once upon a time in Mexico, back in the 80s. Once upon a time in Mexico, back in the 80s. 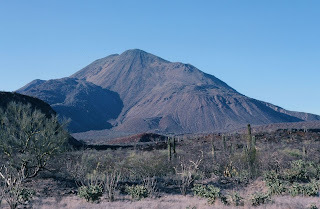 I flew to LA from Toronto, and a few days later was wandering among cacti and creosote bushes toward a spectacular volcano. This is the Volcan las Tres Virgenes. If you want a Google Earth peek at the peak, it's here: 27 28 05.88 N 112 35 25.90 W. We were supposed to be looking for lizards, but judging from the sequence of pictures I took, I was severely distracted by strange plants and rock formations. Such as here. 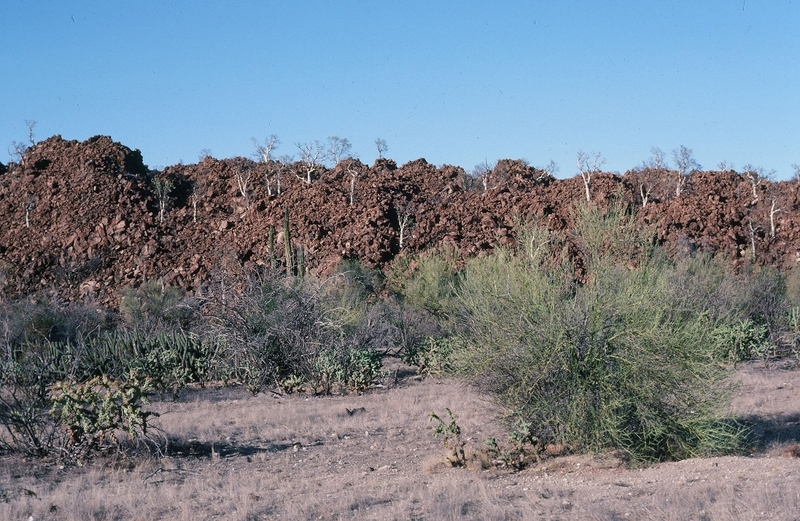 This pile of red rubble is a two-story tongue of weathered lava. The sticks springing from it are extremely mysterious and tortured elephant trees. 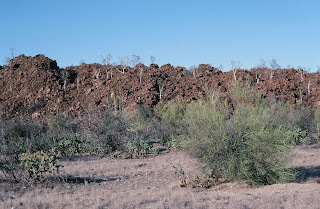 What are they, and why do they live there among tumbled igneous boulders? It all comes back to me now. My head is spinning and I haven't slept since the plane landed, plus my supervisor has us on his diet, which is more-or-less food-free. I feel like toppling over in the dust--which is not advisable because usually there are plants in the way and almost everything in Mexico is prickly. 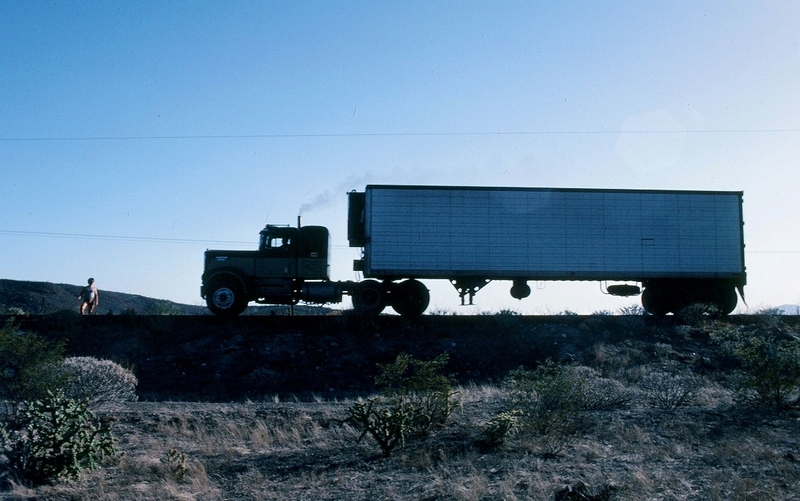 Turning around, back toward the road, I spy a similarly impaired man, a member of our team wearing the uniform of tight T and short shorts (recall, it was the 80s), fearlessly and senselessly staring down a thundering transport truck. Tell us more. When I came home from a three month collecting trip to Mexico at age 20 I suffered from reverse culture shock. New beasties, real Mexican food when we hit town, strange enchanting landscapes -- it kinda blew my mind and I loved it. But I did get really tired of Spam.